In combination with our PowerMax 2-step voltage regulator, or matched a smart multi-step regulator, you can be sure that your PowerMax alternator represents one of the most efficient methods of charging your batteries. With 5-6 times more charging power than standard alternators, a PowerMax provides reduced engine running time which will save on fuel consumption, noise, heat and main engine wear and tear. And since the Powermax is designed to produce high charging current at low engine RPM, your batteries will get a fast, healthy charge even when the engine is idling. This combination is perfect for sailboats charging batteries while anchored or moored. The Powermax 125 is by far, our most popular selling Powermax. The main reason for this is because it has the highest output at the lowest engine speed. This means you'll charge faster, at idle, with less engine running time with this PowerMax. All PowerMax Alternators, except the PowerMax LT's, require an external regulator to operate. See the External Regulators page for more information. 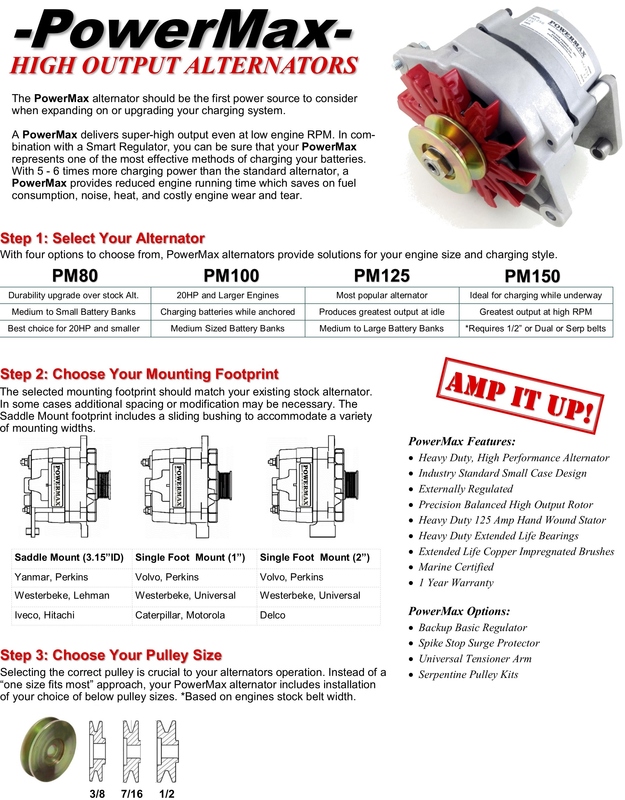 All PowerMax Alternators come with your choice of a single or a dual pulley. Use the saddle mount shown at left, for Yanmar and many Westerbeke and Volvo-Penta engines.